A car is more than four doors, an engine, a few seats, and two pedals. In fact, the average modern car is made up of about 2,000 parts, says The Globe and Mail. That’s a lot of parts and pieces to keep track of when it comes to repair and everyday maintenance! 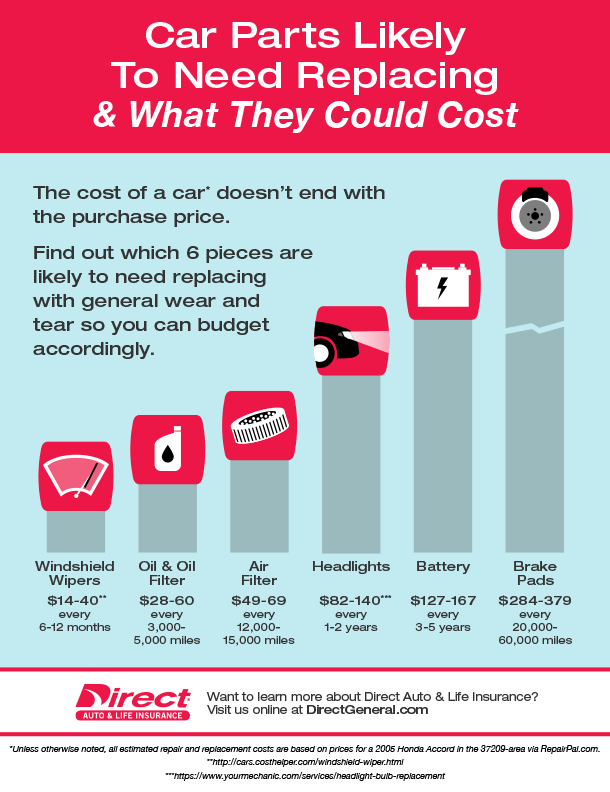 Fortunately, we’ve pinpointed the top six pieces most likely to need replacement with general wear and tear, how much they could cost you to replace (from cheapest to most expensive), and how often you should plan on budgeting for such expenses. Read on to learn more about the power of a little preventative maintenance and Direct Auto & Life Insurance’s 24-7 Roadside Assistance plan—for help when you need it and peace of mind when you don’t. There’s nothing worse than getting caught in a downpour of rain, completely unprepared. While forgetting your umbrella may be a hassle, letting your windshield wipers get into bad shape can do more harm than a sunken hairdo from the rain. Over time, the rubber on the wipers can crack, tear, and simply fall apart…leaving you with a streaky windshield that’s tough to see through. Talk about a serious safety hazard! When to replace: About every 6-12 months or when you start to notice streaks on your windshield. Motor oil keeps your engine running smoothly and at the right temperature. When there’s enough oil (and enough fresh oil), the oil will properly lubricate your engine and keep all the moving parts, well, moving. When your motor oil level gets too low or the oil gets too dirty, your engine’s life and efficiency pay the price, and so do you. Because oil is so essential to keeping your engine healthy (and because it’s used each and every time you turn on your car) it typically needs to be replaced fairly often. When to change: Check your owner’s manual for recommendations specific to your vehicle. General guidelines suggest having your oil and oil filter changed every 3,000-5,000 miles. Just like your home’s HVAC system, your car has an air filter. This little cylinder keeps dirt, dust, and other nasty little particles from entering your engine and other airways. When the filter is dirty and overworked, your engine is forced to work harder, leading to a potential decrease in fuel efficiency and engine power. When to replace: Annually or every 12,000 to 15,000, although you could need more frequent changes if you live in a dusty or sandy area. Check your owner’s manual. When you begin a journey, it’s important to know where you’re going. If you can’t see the road or others on it, you’ve got a problem. Keep your lights bright to avoid unexpected road dangers. Just like other consumable parts on your car, your lights can dim or go out completely over time. When to replace: Most headlights should last 1-2 years or longer. Psst! Did you know? You could save money by replacing your headlights on your own! With summer on it’s way, this one’s pretty important to pay attention to. According to AAA, “Heat is the number one cause of battery failure and reduced battery life.” If you turn your car key and absolutely nothing happens (no lights or “dings” or anything) then you could have a dead battery sitting under your hood. Or if you find yourself calling friends, family, or your friendly Roadside Assistance plan for jump starts every other week, it’s time for a battery replacement. When to replace: About every 3-5 years, depending on your charging system and battery make/model. The only thing worse than a car that won’t start is a car that won’t stop. Help protect yourself and your vehicle by making sure your brake pads don’t get too worn. When to replace: Every 20,000-60,000 miles depending on driving conditions or when you hear squeaks or grinding noises as you brake. Preventative car maintenance could help you save money on major repairs down the road, but no one can predict the future. If one of your car’s many parts goes pop, clunk, or snap and leaves you stranded, there’s always Direct Auto & Life Insurance’s 24-7 Roadside Assistance plan. Call 1-877-GO-DIRECT to learn more about Roadside Assistance and see how it pays for itself after just one use! *Unless otherwise noted, all estimated repair and replacement costs are based on prices for a 2005 Honda Accord in the 37209-area via RepairPal.com.